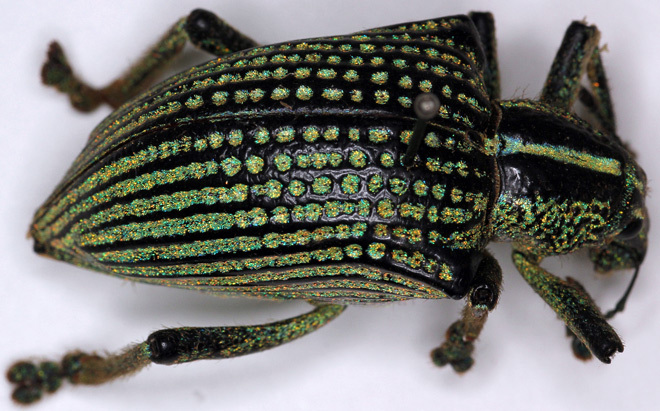 Like a gem-studded overcoat, the diamond weevil's jet-black wings are covered by pits filled with sparkling, rainbow-colored scales. Researchers have studied these "diamonds" since the weevil's discovery in the early 19th century but, until recently, no one knew know how the scales reflected so much light. A new high-tech investigation reveals the diamonds are just that: chitin in a diamond-type arrangement that's optimized to throw off brilliant greens, yellows and oranges. What most people call diamonds are made of carbon, but other materials can take on the same crystal structure, called diamond cubic. "Materials scientists could look to these scales to inspire new materials, but we don't yet know how they are made," said biophysicist Bodo Wilts of the University of Groningen, co-author of a Dec. 21 study of the scales in Journal of the Royal Society Interface. "We've got some catching up to do," Wilts said. "The nature-produced tiny structures are far beyond any human designs." The scales are a type of three-dimensional crystal, called a photonic crystal, which is much like an opal. Each kind of photonic crystal reflects a specific wavelength of light at a specific orientation. Other crystals lacking a regular 3-D structure, meanwhile, aren't as brilliant or iridescent. Wilts' team used a battery of tools to investigate the photonic studs the inch-long weevil, the Brazilian species of which is known as Entimus imperialis (pictured above). Follow along in this gallery.